Oh yes, Minister Sinckler, his friend Leroy Parris and all the other big ups who helped build the CLICO house of cards would love to see limits on public discussion about CLICO. The Minister of Finance urged “all parties, including the media, not to try whipping up a frenzy”. We’ve got news for Minister Sinckler: There’s a whole lot of people on this island and throughout the Caribbean who don’t trust Minister Sinckler or the DLP government. The DLP and senior Ministers (including the late Prime Minister Thompson) have an all too close and non-transparent relationship with CLICO, Leroy Parris and the rest of the people who took our money. 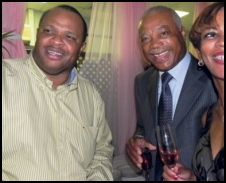 Minister Sinckler and the DLP government still have too close a relationship with Mr. Parris. Here’s a photo (above) published in The Nation last week showing our Minister of Finance socializing with Leroy Parris. It looks like business as usual to us and just about everybody else who saw the photo. Frankly Minister Sinckler, we’re not interested if you “just happened” to be standing next to Leroy when the photo was taken. It’s a small thing when compared to your party’s long history with Mr. Parris. Tell us this, Minister Sinckler: How much money did the Democratic Labour Party receive from CLICO and associated companies and people over the years? Is the DLP going to give that money back to the folks who lost everything? Minister Sinckler, did the fact that Leroy Parris and CLICO supported the DLP have anything to do with the lack of government oversight about Clico? Did the fact that former Prime Minister David Thompson was CLICO’s lawyer for years and years influence the DLP government’s policies towards CLICO? Does the long term close relationship between CLICO, Parris, the DLP and David Thompson still have any influence on the DLP government?